Canadian whisky doesn’t get a lot of love from the craft cocktail community. 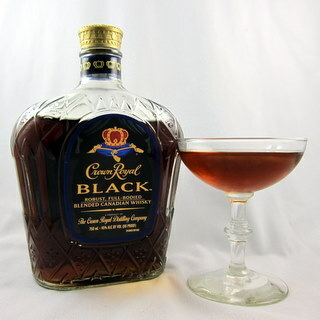 So when I was given an opportunity to sample Crown Royal Black, I wanted to approach it with an open mind. Unfortunately, it didn’t do much to improve my opinion of the category. The first thing I noticed is it’s surprisingly dark in color.1 Compared to the other whiskeys in my bar, its color does have more black notes, as opposed to the deep reds I associate with aged liquors. I’m not quite sure how they achieved this color, except to note that Canadian whisky makers are allowed to add caramel and flavorings. Smelling it, the strongest scents were a caramel sweetness, some wood, and vanilla. Taking a taste, the first thing I noticed was a strong pepper flavor, which lasted quite a long time. There was also a woody flavor. I detected a hint of charcoal, which surprised me – I think of charcoal as a filtering agent, not a flavoring one. They do highlight that it’s aged in charred oak barrels, but I don’t get this sort of burnt flavor from bourbon. While the taste is reasonably well balanced between sweet and pepper at the front, that tapers off to an unpleasant astringency. Adding water through a single ice cube didn’t help much. It brought the sweetness out even more strongly, but not in a way that balanced the unpleasant flavors. I can’t imagine wanting to sip this straight. Hoping to enjoy it mixed, I first tried it in a Manhattan. It failed miserably. The charcoal notes I tasted before were highlighted, as well as the astringency. I searched high and low for a Canadian whisky cocktail to try. I’ve not yet hit on a recipe for the Scofflaw I really enjoy.2 Searching the CocktailDB, I found the Quebec cocktail, which seemed worth a try. I thought the unique combination of additional flavors might balance the whisky out. I made it two sips into this cocktail before I gave up on it. Once again, the odd flavor of the Crown Royal Black made a mess of the party. It amplified the funky maraschino flavor in a most unpleasant way. I can say one positive thing about Crown Royal Black. It is better than Crown Royal. But I say that with bitterness, because I actually purchased a 375 ml bottle of Crown Royal to taste side-by-side.3 Regular Crown Royal tastes predominantly of sugar and astringency to me. I know there are some very nice Canadian whiskies out there. I look forward to trying them. Sadly, Crown Royal Black is not among them. Why not a mini? I have no answer for that question.